Physiologic jaundice in newborns manifests itself by yellow staining of the skin and mucous membranes. Especially noticeable are the yellow occurrences on the eye sclera. Physiologic jaundice occurs in 60% of term and 80% of preterm infants in the first week after birth. Most often these symptoms are not associated with hepatitis and do not require special treatment. Jaundice that appears due to various negative factors during a woman’s pregnancy affects the increase of bilirubin in mother’s blood and slows its withdrawal from the blood of the newborn. Physiological jaundice can develop in the newborn, due to the extensive destruction of red blood cells after birth. To obtain the normal amount of oxygen in the womb, the fetus needs a large number of red blood cells. After birth, the baby begins to breathe with the lungs and some of the red blood cells, obtained in the womb, begin to break down at high speed, thereby increasing the level of bilirubin. Neonatal jaundice can occur due to weak functioning of the organs, which are responsible for the removal of toxins from the newborn’s body. Weakened liver and kidneys can’t cope with the excess of bilirubin. Physiological jaundice may be caused by intrauterine infection of the mother, by conflict rhesus factor of the mother and baby, and also if the mother has diabetes. if the newborn and his mother have different blood group and rhesus factor, then the destruction of red blood cells occurs En masse. In this case, neonatal jaundice may occur on the first day after birth. 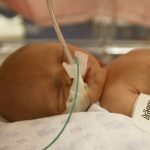 jaundice develops more often in premature babies; the symptoms in such cases last longer. metabolic disturbance of the newborn (disorder of the thyroid gland) can lead to the development of physiological jaundice due to the rapid destruction of red blood cells in such condition. birth trauma may also increase bilirubin in the blood, which in turn causes jaundice. The cause of physiological jaundice may be heredity. If these symptoms were observed in parents or elder children there is high probability of physiological jaundice. 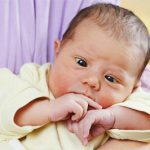 How long does physiological jaundice last in newborns? 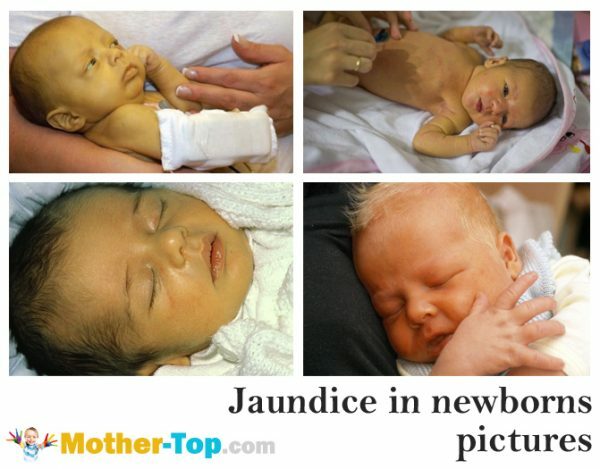 This type of jaundice is found in almost 80% of newborns and usually lasts up to 1−2 weeks. Most often physiological jaundice does not do the newborn any harm, as bilirubin level does not critically exceed the permissible norms. There are no prolonged negative effects after neonatal jaundice. We can speak about full recovery when bilirubin begins to contact with blood proteins and is excreted through the already strong liver into the intestine. If the baby is breastfed, then jaundice passes off faster. Mother’s milk has a natural laxative effect on the baby’s body and bilirubin together with meconium (the earliest stool) withdraws much faster. 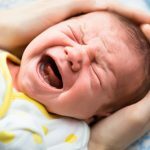 In premature infants, the symptoms of jaundice last longer. The bilirubin level is constantly increasing during first 5−6 days after birth, and full recovery occurs only after 3−4 weeks. In this case, the baby needs additional treatment, which includes medication and phototherapy under the light of a special lamp. Under the effect of light, bilirubin is converted to lumirubin that quickly penetrates into the bile and urine and is easily excreted from the body. Most often, no jaundice treatment is required. Neonatal jaundice passes off in 1−2 weeks, when the functions of the newborn’s liver and kidneys improve. It is very important to breastfeed the baby so that he gets the colostrum, which has a beneficial effect on bowel functions and promotes removal of meconium from the body. The newborn should regularly receive food (every 2−3 hours). This will contribute to more frequent emptying of the intestines and the natural removal of bilirubin from the body. While the symptoms are still visible, it is possible to speed up the healing process with the help of sunbathing. It’s enough to take naked baby outside on a warm sunny day or to hold him near the window, if it is cold or you are in hospital. When the bilirubin level is not falling and recovery is delayed, neonatal jaundice is treated with the help of phototherapy. Phototherapy is the use of ultraviolet rays to reduce the bilirubin level in baby’s skin. During therapy, ultraviolet light converts bilirubin to a safe substance that can dissolve in water and go off the body along with urine and feces. The baby is placed in a special box with a UV lamp inside. Often this procedure is enough, but in cases of intensive therapy, doctors can use two or even three ultraviolet lamps. During the course of phototherapy, constant supervision of a nurse or a mother is obligatory. 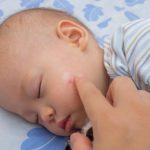 The doctor must determine the optimal procedure time for the newborn to prevent skin burns, overheating and dehydration. During phototherapy, the physician should regularly take blood tests to identify the reasons, which caused neonatal jaundice When bilirubin level falls, the treatment is terminated. If jaundice doesn’t go away, then the baby needs further and more serious treatment. If the newborn is at home with signs of neonatal jaundice and the symptoms persist, you should immediately consult a doctor and get tested. Reduced level of the protein albumin in the blood. A certain amount of bilirubin can penetrate into the tissues. The penetration of large amounts of bilirubin in brain tissue can develop kernicterus. This disease leads to mental retardation, deafness and seizures. Aggravation of jaundice can cause muscle infection, which leads to complete paralysis. On condition of timely diagnosis and treatment of physiological jaundice, its symptoms disappear quickly and don’t cause any complications.